The 2018 voters’ roll has been printed and does not have double registrations, nor dead or ghost voters, as it was specifically compiled to address the flaws of the 2013 voters’ roll, Zimbabwe Electoral Commission chair Justice Priscilla Chigumba has said. 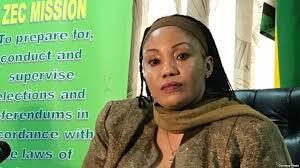 In a statement released yesterday, Justice Chigumba said: “The Commission would be pleased to receive a list of these dead voters for further investigation”, while failure to prove such claims would mean the allegations are false. Justice Chigumba said the Commission would not deny voters with similar names and dates of birth their right to vote simply because of allegations that they were “ghosts”. The final voters’ roll has demographic details of the voter such as the first name, surname, date of birth, ID number and a photograph of the voter appear on the roll. “In 2017, the Zimbabwe Electoral Commission made a bold decision to compile a new voters’ roll for the 2018 Harmonised Elections because of the shortcomings of the 2013 voters’ roll which stakeholders had brought to the attention of the Commission,” said Justice Chigumba. “The Commission and stakeholders were in agreement that the 2013 voters’ roll had become defunct because it was not constantly updated to cater for changes in the demography of voters. The Commission, therefore, finds it very strange for anyone to compare the 2013 and the 2018 voters’ rolls when it is well documented that stakeholders had unanimously agreed that the 2013 roll had become difficult to use for any credible election. “What is even more shocking is the allegation that the Commission copied dead voters from the 2013 voters’ roll. It is difficult to imagine how a dead person from the 2013 roll could have resurrected and showed up at a registration centre between September 2017 and June 2018 to have their photo and fingerprints recorded for the new voters’ roll. In a bid to produce a water tight voters’ roll, the commission set up inspection centres throughout the country to allow physical inspection of the voters’ roll between May 19 and 29. Following the inspection period, Justice Chigumba said, additional work was done on the voters’ roll to effect data corrections. “During the inspection period, 114 691 requests for voter registration data corrections were received and effected,” she said. “Section 32 of the Electoral Act 2:13 mandates the Commission to ensure that no one person appears more than once in the voters’ roll. Justice Chigumba revealed that 8 146 registered voters had died before printing of the voters’ roll and had since been removed. “In order to identify dead voters on the 2018 voters’ roll, the Commission engaged the office of the Registrar General who is responsible for the registration of births and deaths,” she said. “During the compilation of the 2018 voters’ roll, the Commission noticed that several people shared identical ID numbers. Such cases were referred to the office of the Registrar General for verification. Some cases were resolved while a number are still under investigation.